“The body – its anatomy and physiology – remains a powerful material and source of study for contemporary artists. 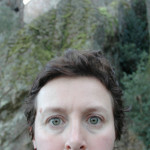 In recent years some have chosen to explore different states of (un) consciousness (such as sleep/ dreams, sleep deprivation, hypnosis) – placing themselves in intense and sometimes risky situations, where their experiences and perceptions of these states are recorded and re-contextualised as artworks.” Louise K Wilson is a visual artist who makes installations, live works, sound works and single channel videos. Processes of research are central to her practice and she frequently involves the participation of individuals from industry, museums, medicine and the scientific community in the making of work. Versions of this paper were originally presented at three conferences in 2000 (‘The Impact of the Artistic Imagination on Science and Technology during the Second Half of the 20th Century’, a panel at the CAA conference, NYC, USA; ‘Uncommon Senses’ at Concordia University, Montreal and ‘Consciousness Reframed: Art, Technology and Consciousness’ at CAiiA-STAR, Newport, Wales). 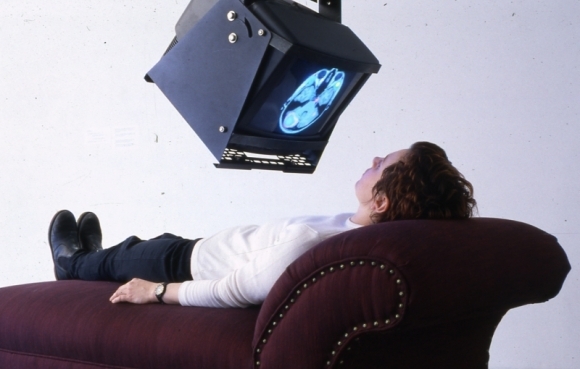 Despite the lengthy intervening passage of time, I’m curious to revisit this territory – prompted by my participation in the current Wellcome Collection exhibition States of Mind: tracing the edges of consciousness where I encountered Aya Ben Ron’s film Still Under Treatment (2005). 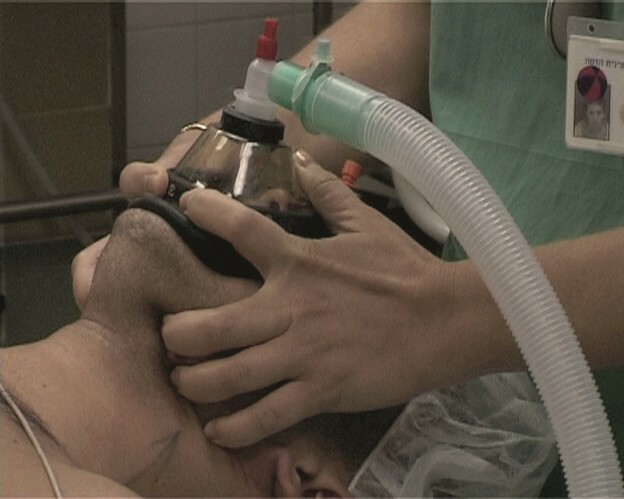 This work, filmed at Hadassah Medical Center in Jerusalem, displays the moment at which seven patients fall unconscious under general anaesthetic. Witnessing their surrender to dreamless surgical sleep is an undeniably troubling experience. The two works Timeline (2003) and Memoriagraph (2016) explore autobiographical memory. The body – its anatomy and physiology – remains a powerful material and source of study for contemporary artists. In recent years some have chosen to explore different states of (un) consciousness (such as sleep/ dreams, sleep deprivation, hypnosis) – placing themselves in intense and sometimes risky situations, where their experiences and perceptions of these states are recorded and re-contextualised as artworks. In these investigations, notions of presence and empathy are emphasized since physical proximity and interaction between artist and audience may be crucial. Sometimes these pieces have been made in consultation with medical researchers. The visuality of the laboratory and its technologies have been appropriated and evoked. These performances may even resemble scientific experimentation and bear some (superficial) comparison. Yet the notion of ‘poetic license’ generally prevails and the scientific necessity for theories to be rigorously quantified is deliberately denied – prompting questions about the limits of scientific methodology. The unconsciousness induced by anaesthesia is arguably the most extreme altered state we can enter. It is still to a large extent unknown. To my knowledge, visual artists have not yet explicitly or deliberately explored the state of general anesthesia. Quite apart from very obvious questions of access, ethics and informed consent, I am curious to consider potential and conceptual strategies for speculative ‘sci-art’ exchange in this field of study. Could this contemporary vacuum of the ‘artistic imagination’ be considered in the light of the ‘literary imagination’ and its effects on medicine in the nineteenth century? In the book Romance, Poetry, Surgical Sleep (1995), anesthesiologist E. M Papper (based at the Miami School of Medicine) provides an extraordinary reflection on the intersections of pain, suffering and the development of anaesthesia in medical history. He pinpoints works from English non-medical literature (from Coleridge, Shelley among others) to show how certain texts exemplified a change in attitude toward suffering and laid the foundation for the general use of anaesthesia in modern medicine. Examples in which the ‘artistic imagination’ has colonized the terminology of anaesthesia are far more apparent. States of induced anaesthesia have provided cogent and alluring metaphors for artists and writers for well over a century and to quote Lawrence Rinder and George Lakoff “metaphor is necessary for any kind of abstract, philosophical, scientific or mathematical thought” (Lakoff & Rinder in Rinder 1999:26). As the technology of anaesthesia and the physiological and psychological effects it prompts are better understood, will current metaphors shift accordingly? How might anaesthetic research (as well as wider research into the nature of consciousness) be shaped or affected by aesthetic imagination? This then is a tentative exploration into how artists might gauge the shifting sense ratios in surgical sleep. Firstly to say my interest in the linked concept of anaesthesia/ aesthetics was originally prompted by my own experiences as a volunteer subject in medical research. The starting point was a desire to intervene within the space of the laboratory and to consider the effects of its technologies on the object of study. I wanted to know how far the imaging and monitoring technologies that reveal physiological and psychological states affect those states. I wonder how far the agency of the subject might affect the experiment. As subject in a series of cognitive, physiological and psychological experiments, I was seemingly well placed to both experience the boundaries between different states of consciousness and observe the blurring between disciplines of study – for example, is a hypnotic dream a real dream? 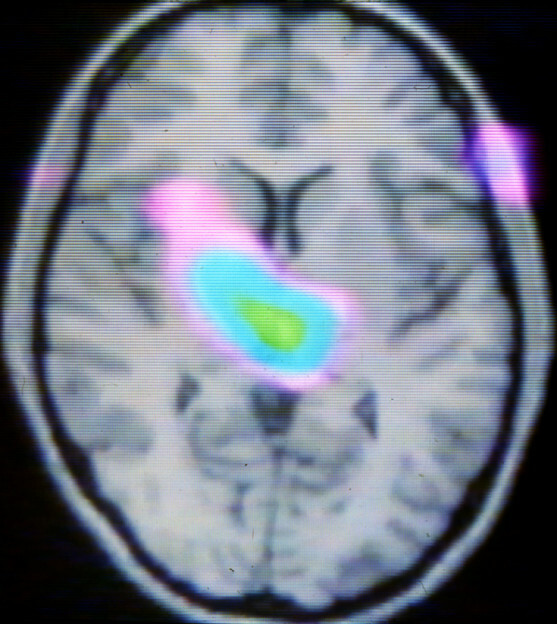 One of the resulting artworks Possessed (1995) utilised data from a research study that required a self-anaesthetised (sleeping) subject monitored by PET scanner and EEG. Ultimately I concluded that the vast array of technological tools and languages used to provoke and to illustrate various states in the lab always produce partial representations. As Susan Buck Morss has argued “the senses maintain an uncivilized and uncivilizable trace, a core of resistance to cultural domestication.”(Buck Morss 1992:6) While the anaesthetized or unconscious subject has relinquished some control in the lab, a degree of intransigence is retained. This sometimes “involuntary’ non-compliance presents a positive affront to mechanisms of power. This metaphorical “inert body” was, for me, very different from the so-called Foucaldian ideal subject of power – the docile body – ready to be “subjected, used, transformed and improved” (Foucault 1977:136). In Aesthetics and Anaesthetics: Walter Benjamin’s Artwork Essay Reconsidered, Susan Buck Morss shows how understandings of the individual in aesthetics, philosophy and neurophysiology converged in the creation of a technic of un-aesthetics in the latter part of the nineteenth century (opiates, hypnosis, nitrous oxide and so on) and details how these were corralled to shield the individual from the ‘shocks’ of modern life (Buck Morss 1992). This experience of intoxication was not limited to “biochemical transformations” however as a “narcotic was made out of reality itself” with the reality of the phantasmagoria – a technological bag of tricks designed to “trick the senses through technical manipulation (…) not by numbing but by flooding the senses” (Buck Morss, 22). Buck Morss’ text is pertinent to a discussion of artworks that locate the body in the context of new sensory environments and ask how far the human sensorium has been permanently reconfigured. The boundary between the body and technology is becoming more transparent. An anxiety articulated by Canadian dream researcher Tore Nielsen, for example, is that manufacturers of Virtual Reality will find a way to access the ‘biological virtual body” that is accessed in dream states. Nielsen points to the practice of dentists apparently using head-mounted VR displays in combination with nitrous oxide (a very euphoric drug). The danger exists because the patients would be “so decoupled from their.. real bodies because of the drug, (that) they can enter the illusory scene more easily.. then it’s an out-of-body experience and (…) that’s where the ethical dangers really start” (Nielsen email, 2000). This simultaneous fear and desire that one is losing touch with one’s physical anchor can be very potent. Similarly anaesthesia both induces and displaces fear. This need to be conscious to apparently retain agency, control and memory is outlined in these two examples of artworks where the visceral impact of the artwork has been mediated and ‘anaesthetised’ to some extent. 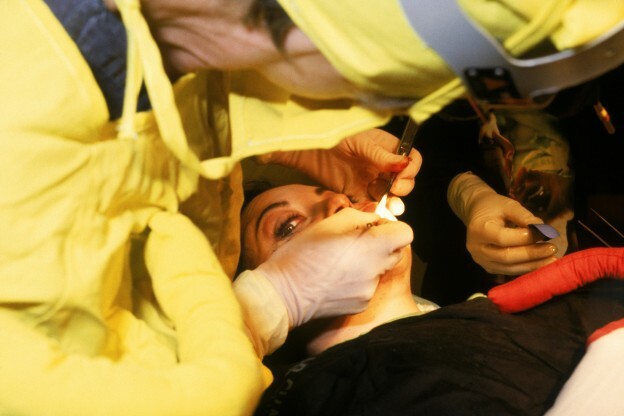 Firstly the provocative decision of French artist Orlan to have her transformatory plastic surgery operations performed using advanced techniques in local anaesthesia. During these carefully staged spectacles, she reads aloud from chosen texts and answers questions from viewers watching remotely – even when undergoing facial surgical procedures. This use of the operating theatre as theatre has historical precedents since surgical voyeurism was encouraged by the techniques of anaesthesia. The introduction of general anaesthetics brought about a radical shift in the Enlightenment practice of performing surgical procedures in an amphitheatre heightening “the theatrical effect, as neither surgeon nor audience had to bother with the feelings of the insensate patient” (Buck Morss, 31). Australian artist Stelarc relates a story about the internal electronic sculpture (Stomach Sculpture, 1993) that was briefly installed inside his stomach cavity, this self–illuminating, sound emitting, extending and retracting capsule structure was designed as an internal sculpture. It was activated by a flexidrive cable and a servo motor with a logic circuit and was inserted approximately 40 cm inside the body. Apparently Stelarc had the option of ingesting medication that would have ‘dried up’ the inside for some hours so that his medical team would be able to more clearly document the internal sculpture with the endoscope. One side effect of this medication would have been short-term amnesia however. Stelarc decided against it taking it: “I was making a comment on the difference between human memory and technological memory (that is) the difficulty of retrieval of information from a biological brain compared with the more ‘reliable” retrieval (or memory) of information with technology.. I am intrigued by the experience of the involuntary, amnesia, anaesthestic and other intimate and alternate possibilities” (Stelarc, email 2000). Notions of the “involuntary” and the “alien” recur within Stelarc’s internet performances where his body is remotely activated or caressed. 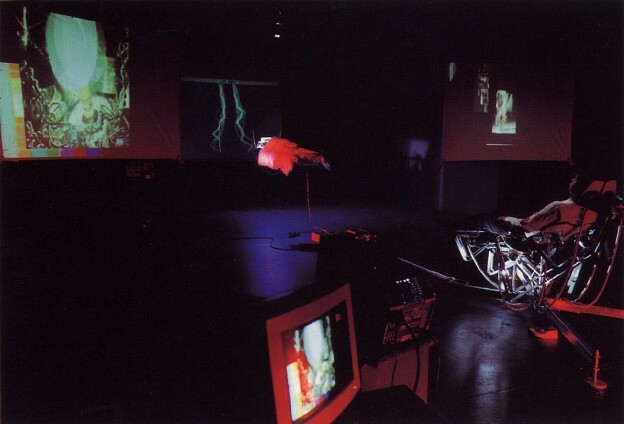 In Ping Body (1996), for example, “the body is telematically scaled-up to respond to the reverberating signals of an extended nervous system, internet activity choreographs and composes the soundtrack” “what you see, but don’t feel, what you see, but can’t control – in both instances parts of your body become ‘alien’ to your agency and physical body’ (Stelarc 1997). Other artists are exploring the nature of consciousness by immersing viewers in a specific experience that necessitates a sensitive physical dialogue (between states of consciousness). The viewer becomes a participant and must open themselves up to the experience of identifying differing and contradictory responses and roles. London-based artist Bruce Gilchrist has over six years been experimenting with his own sleep-dreaming patterns following initial research at the Clinical Psychology Sleep-Research Laboratory at the University of Texas at Austin and with British researcher Keith Hearne. His subsequent performances have explored the complex relationship between the dreamer and the immediate environment and have incorporated radical interfaces for viewers to communicate with his sleeping body. In A Way of Asking for Reasons (1994) audience members were invited to communicate with four performers’ sleeping bodies (Gilchrist and three others) by sending Morse code messages administered by electric shocks. The sleepers had firstly inverted their sleep patterns with the help of neurosynchronisers (brain machines) and “(d)uring their waking hours they undertook conditioned-learning sessions to recognize language encoded within electrical stimuli. With their neurosynchronizers tuned to the theta frequency, a Transcutaneous Electrical Stimulator Unit gave them mild electric shock in morse code (…) once the performers were sleeping on the shale heap, the audience could start sending messages (…) As well as the expected outcomes [shared dream imagery for example], the four performers found themselves suffering from a number of unpredicted effects from sleep deprivation and inversion” (Warr 1996: 14-15). As Gilchrist explains: “I tried to encourage the group I was working with to be open minded and vigilant in terms of phenomena. The general desire was to experience some sort of group lucidity within the dream state. Probably the closest we got to this was a number of false awakenings, though not necessarily at the same time. These false awakenings would appear to unfold interminably, becoming plague-like, leaving one feeling exhausted and badly rested. The gradual sleep inversion coupled with the extreme discomfort of sleeping on site resulted in a cumulative sleep deprivation which may have been a factor in the many reports of aural and visual hallucination”. Gilchrist was interested in the way external stimuli appear to be incorporated into dream content. Latterly he used a device from The Lucidity Institute, that detects REM sleep using an infra-red sensor and then delivers photic stimulation. He describes the haptic sensations and visual imagery this gives rise to: the signals from a TENS unit can be incorporated into dream content as an “earthquake, as fluid bursting through skin or as a collapsing building; photic signals may appear less dramatically as sunlight glancing off a reflective surface or being photographed by a flash camera” (Warr, 16). Questions that both collapse distance between the viewer and performer and expose limitations of language. As Jeni Walwin noted: “it seems appropriate that as Gilchrist is searching for a new language based on code and electrical impulse which might offer a means of communication between the conscious and subconscious minds, he is meanwhile highlighting the inadequacies of current methods of verbal expression” (Walwin 1997). Whilst anaesthesia is of course quantitively different from sleep, I am struck by the similarity between tenets of Gilchrist’s work and various experimental studies to assess levels of consciousness during anaesthesia. Dr Michael Wang (a clinical psychologist at Hull University) for example uses a technique called the Isolated Forearm Technique to detect awareness during surgery. By stopping muscle relaxant getting into the forearm it enables patients to move their hand, and thereby respond to questions, if they wake during surgery. A loop tape relays instructions “If you can hear my voice – open and close the fingers of your right hand… if you’re in pain, squeeze my hand twice” (BBC Radio 4 Altered States 1998). According to Wang, a line of communication is established, various conditional messages can be put across to the patient and “on occasion you can enter into a very sensible communication (…) using these techniques we can demonstrate that patients do experience high levels of consciousness from time to time during surgery but very commonly they’ll have no knowledge of this after the operation” (BBC Radio 4 Altered States 1998). In the light of Gilchrist’s work and his attempts to engineer subtle strategies to explore altered states, I wonder about potential research that could extend this communication to include the whole area of unconscious processing of information – whether it’s olfactory, pictorial imagery and so on. Over the last decade or so, the notion that anaesthesia is a complete abolition of conscious function with time suspended and memory erased has been disputed. Studies into the pain and memories patients have under general anaesthesia have under general anaesthesia have suggested multiple levels of brain processing dissociated from waking consciousness. Results of this research would of interest not just to clinicians but to those within the burgeoning field of consciousness research (consciousness is now hotly debated in the fields of cognitive science, neurobiology, psychology and philosophy giving rise to emergent interdisciplinary approaches and projects). For example anaesthesiologist Stuart Hameroff and mathematical physicist Roger Penrose have proposed that consciousness arises from physical processes taking place in microtubules, which are protein structures inside neurons. One rationale of the microtube quantum theory is the curious range of chemicals – including nitrous oxide, ether, isofluorane and xenon – that can act as general anaesthetics and suppress consciousness. While on a molecular level scientists may be getting closer to knowing how anaesthetics affect cognitive functions and implicit and explicit memory. As writer Tracey Warr notes “over the last century our conscious data-processing system – rationality – has had the emphasis. Brain research into the cerebrum controlling conscious actions is quite advanced but the cerebellum, controlling the unconscious, is equally complex and relatively unexplained. Unconsciousness is perhaps the right place to be looking for explanations about consciousness” (Warr, 17-18). “My take on awareness during anaesthesia is that the brain can, and sometimes does, process information in circumstances where it is unconscious. We construct consciousness, and so the information never gets assembled into any meaningful state. Clever experiments can reveal that this information is there, and the right challenges can lead the brain to draw upon the information. However, the person generally thinks that he/she does not have the information” (Chapman, email February 4, 2000). The state of emerging from an anaesthetic might be an interesting one to explore he believes. Here we construct our sense of self and our view of the world. When awaking from sleep and from anaesthetic, there is a brief period where we are “scattered, incomplete persons in an incoherent world” (Chapman, email February 4, 2000). Such concepts of what it means to be human, to have subjectivity and sense of self, telescopes us back to the nineteenth century. In the aforementioned book by E.M. Papper, a very specific socio-political moment is described when a number of the Romantic poets and visual artists focused on the needs and rights of the individual to be free of pain and suffering. Papper maintains this new vision of the need to lessen pain or avoid it if possible was crucial in leading to the discovery and wider usage of anaesthesia. Amongst others, he provides a case study of the poet Percy Bysshe Shelley whose poem Prometheus Unbound deals in a remarkable way with the “dream like states that resemble the mid-altering condition of surgical anaesthesia (in which) he saw the future possibilities of the prevention of pain by a foreign substance that influences the brain and makes it sleep. Shelley wrote lines that are a poetic forecast of the advent of anaesthesia (even) predicting the nature of the experience one has during the induction of anaesthesia. Grows dizzy – I see thin shapes within the mist. “There is, of course, no reason to think that Shelley could have known of anaesthesia when he was composing Prometheus Unbound, but there are many direct allusions to matters that concern the anesthetic process, including the loss of consciousness, the provision of amnesia, analgesia, and other attributes of anaesthesia that were to become both cheered and controversial when the scientific and clinical aspects of the anaesthetic process were considered” (Papper 1995:125). In conclusion, the qualities of live arts practice evidently offer both insightful and uneasy means to explore notions of consciousness. While it may be difficult to currently assess how the experiments of artists have categorically advanced the scientific understanding, to quote Jane Goodall, this “doesn’t mean that they do not advance (…) awareness…experiments on the body can serve as important social experiments, by testing out taboos and imperatives, challenging conventional fears and reinvesting in excluded possibilities” (Goodall 1997). To Goodall’s entreaty, we should privilege the crucial role of metaphor, of verbal and visual imagery and language that moves between realms and disciplines to visualize the unknown, shaping and informing practical experimentation. Radio 4 (BBC) Altered States (Anaesthesia) 1998. Buck-Morss, S ‘Aesthetics and Anaesthetics: Walter Benjamin’s Artwork Essay Reconsidered’ in October, Vol. 62 Autumn, 1992. Goodall, J. ‘Whose Body? Ethics and Experimentation in art’ in Artlink (Art and Medicine issue) Vol 17 no.2, 1997. Lury, C. 1998 Prosthetic Culture: Photography, Memory, and Identity. London: Routledge. Papper, E M. 1995 Romance, Poetry, Surgical Sleep: Literature Influences Medicine Westport, Conn. USA: Greenwood Press. Rinder, L. (ed) 1999 ‘Consciousness art: attending to the quality of experience’ in Searchlight: consciousness at the millennium New York: Thames and Hudson. Stelarc 1997 ‘Parasite Visions’ for Technomorphica http://v2.nl/archive/articles/parasite-visions (accessed March 15, 2016). Walwin, J. 1997 ‘Subtle Bodies: The work of Bruce Gilchrist’ in Low Tide: writings on Artists Collaborations London: Black Dog Publishing. Warr, T. 1996 ‘Sleeper: Risk and the Artist’s Body’ in Performance Research Journal, 1 (2): 1-19.